Violet - Violet or purple liquid is not something you see in the toilet bowl every day. However, you can get violet or purple urine if you eat both beets (red) and methylene blue dye (blue). Methylene blue is safe in low quantities. Blue - Methylene blue will turn your urine blue or greenish-blue. It can also color the whites of your eyes blue. The coloration of both urine and eyes is reversible. At one time, methylene blue was considered to be an effective treatment ​against malaria. As far as urine colorants go, this one is considered to be reasonably safe to eat, though you should be aware some people are allergic to methylene blue. 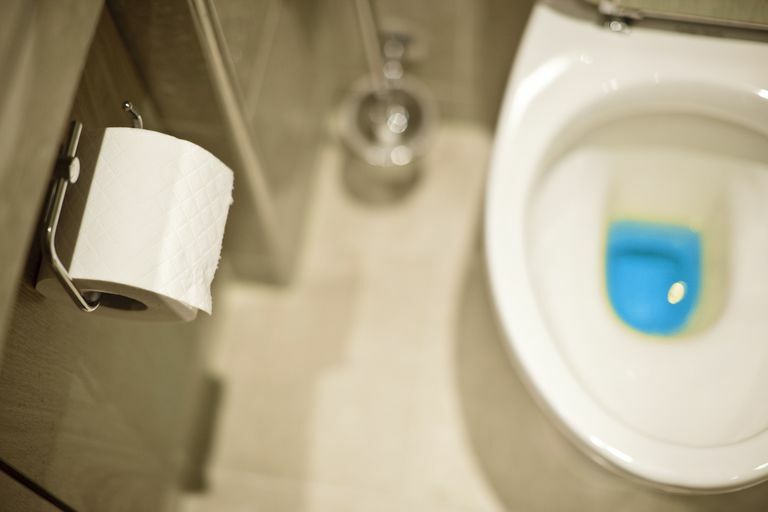 Food coloring may turn your urine blue. A rare, inherited disease known as porphyria can cause blue urine. King George III's blue urine may have been attributable to porphyria. Green - Asparagus will turn urine green and also will give it a very strong odor (although not everyone can smell it). Food coloring can turn your urine green, as can certain medications. Yellow - That is the normal color of urine. If your pee is too pale to see the color, it means you're over-hydrated. If you have colorless urine yet want a yellow tint, you can take a vitamin B12 capsule. Another option, which is also extremely fast, is to drink a colored energy drink. Look for one that contains added B vitamins. Amber - Dark golden urine often results from dehydration (not drinking enough water). A very dark color might indicate the presence of bile in urine, which is symptomatic of a medical condition. To safely darken yellow urine, try taking a B vitamin. Drinking an energy drink won't help, because the caffeine acts as a diuretic, adding more water to your urine and making it colorful, but pale. Orange - Eating rhubarb or senna can turn your urine orange. Senna is a dangerous herb to mess with. Stick with rhubarb. Red - Eating beets or blackberries can turn your urine red. Blueberries can also tint urine pink. Even though the berries are blue, the pigment in them is a natural pH indicator that changes color. The normal pH of urine is slightly acidic first thing in the morning, trending toward slightly alkaline later in the day. The color of your urine from eating foods can be affected by the time of day you eat them. Pink - Pink can result from a urinary tract infection or from eating smaller quantities of beets or blackberries. Brown - Brown urine results from a kidney dysfunction, jaundice, or from an overdose of the herb goldenseal. You should probably avoid this color, if at all possible. Black - Black is not a good color for your urine. You get this from Blackwater Fever, which is associated with malaria. The black color comes from massive death of your blood cells, leading (usually) to the victim's death. Milky or Cloudy - This results from blood, protein, or pus in the urine and usually indicates an illness. It's not an effect you can achieve by eating or drinking something non-toxic. Clear - All it takes to achieve clear urine is to drink plenty of water. Don't go overboard, since even too much water can be bad for you. If you decide to try any of these out for yourself, be sure to read the safety information that accompanies the chemicals and use common sense. If you are concerned you have colored urine because of an illness, be sure to consult a health care professional.